First it was, “are you on Facebook?” Then it was, “do you tweet,” and now “did you pin that?” Pin, as in Pinterest, as in the “you think it’s stupid but next thing you know you are pinning everything and getting excited about creating new boards” website. If you don’t know it, Pinterest is a combination of scrapbooking and bookmarking a website. You create a board and then “pin” things to it. You know how when you want to come back to a website, you bookmark it? Now you pin a thumbnail of it and it looks pretty. Anywho, one of my Pinterest boards is for recipe saving. I always intend to but I’ve never actually made any of the recipes, until, you guessed it, until now! I have been so bored with my eating lately I figured I better shake things up, and so I attempted to make Creamy Avocado Pasta, originally found on the Flourishing Foodie website. 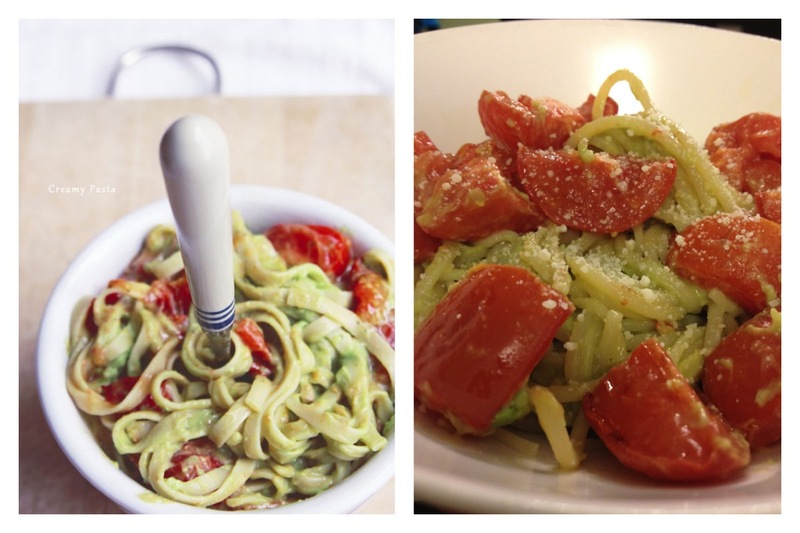 In cooking, for me, the more simple the better and this seemed pretty simple – tomatoes, avocado, olive oil, lemon juice, garlic and pasta. It was simple and it was really good! OK, so now the details. (To be honest, I don’t really know how it works doing a recipe review and I don’t want to post anything without permission so I’m not going to post the whole recipe, but you can find it here. Easy to make, even for me! Roasting the tomatoes added incredible flavor. 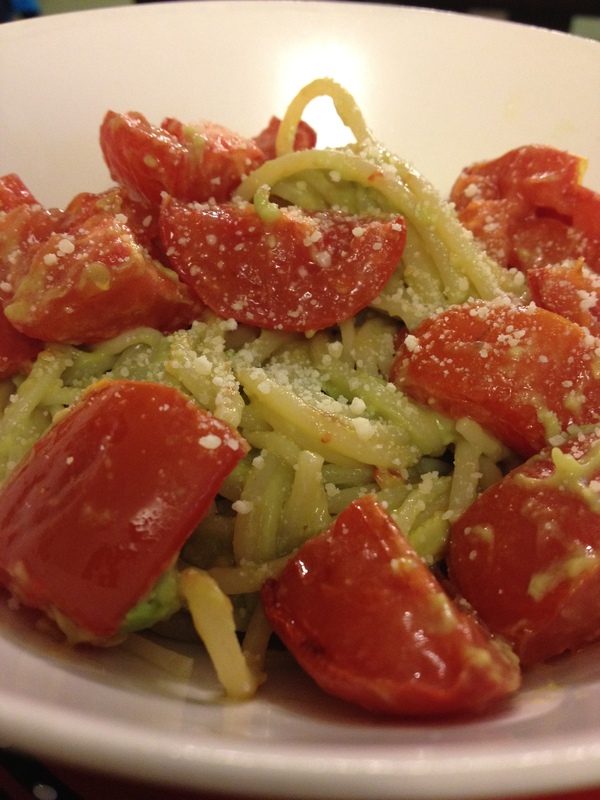 It also gave me time to make the avocado mix before starting the pasta/finishing the tomatoes. I get very flustered in the kitchen doing more than one thing at a time! 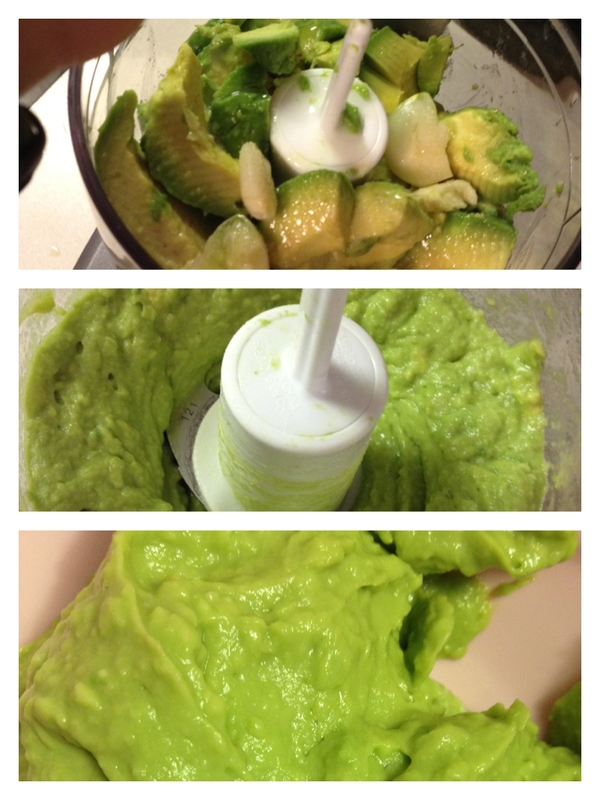 The avocado mix (avocado, garlic, lemon juice and olive oil) was so good I could eat it right out of the bowl. I will definitely make just that again and use as a dip. The recipe used fettuccine. We didn’t have any so I used regular spaghetti, which I found really hard to mix together, so at hubby’s suggestion, I’d probably use bow tie, rotini or penne next time. It was a little too creamy for my taste. The recipe says to blend the avocado mix until “smooth and creamy.” It’s possible that I mixed too much so next time I’ll leave it a little chunkier. It didn’t taste too oily but I will cut back the oil next time. With the avocados and lemon juice, I think two tablespoons of oil is too much. 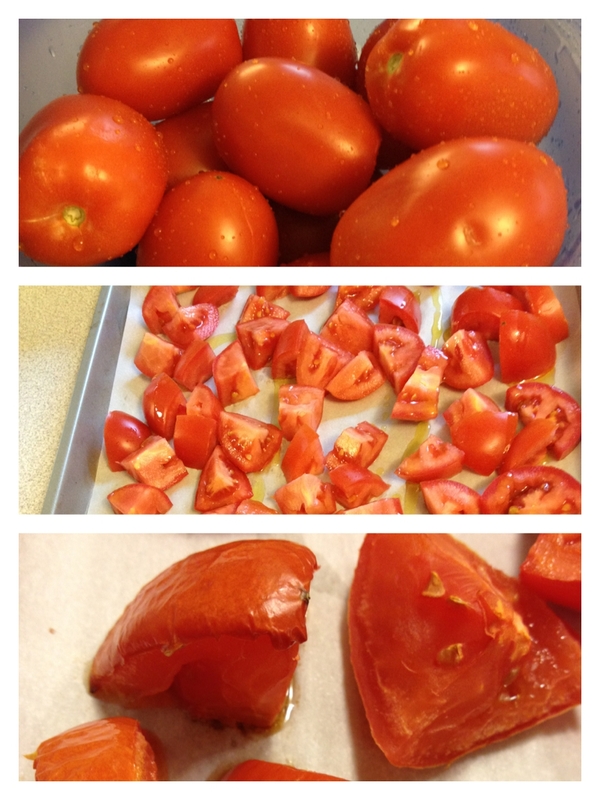 The recipe called for Campari tomatoes. I have no idea what those are but based on the photos I’m guessing like the smaller tomatoes on the vine. I couldn’t find those so I used plum tomatoes. I think next time I’ll use cherry tomatoes. It will be a little harder to cut up (those damn little ones always slip away!) but the plum tomatoes, even cut up, were too big for the pasta. Being my usual self, I added in two extra garlic cloves. I will not do that again. The garlic flavor was a little overwhelming. She made a good call there in her recipe! I didn’t have any pine nuts, which the recipe called for (and at $4.62 a bag was not about to buy any! ), so I don’t know what that would have added. I think the nutty crunch would probably be great. The recipe said to use four servings of pasta (instead of a measurable amount). I have no idea how much that is without measuring. Given how much avocado mix I had, I might not have used enough pasta. I’ll have to fool with that. In short, this was awesome and I’ll definitely make again, with a few minor changes. But that’s the fun with recipes – taking someone else’s creation and making it your own! Or as I like to call it, letting someone else do all the work and sweeping in for the victory! And least I forget, because I’m not sure exactly how much pasta I used, it’s a little hard to figure out the Weight Watchers points. I’m estimating this at 8-10PP per serving. I know that’s vague but I’ll come back and update after I make it again and measure out the pasta. Don’t freak out about the high points. I wouldn’t eat this every day and, other than the pasta, this is healthy eating at it’s best. Avocado and olive oil are fantastically good for you, and if you cut the oil like I plan to do, it will knock one point off. Looks yummy. I’m going to give the recipe a try. I don’t think I’ve tried any of my pinterest recipes either! This one looks really good.